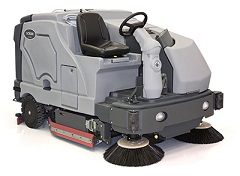 One Source Equipment Rentals has industrial ride-on floor sweeper scrubbers for rent from Advance. These all-in-one sweeper scrubbers are designed to both sweep and scrub floors in a single pass eliminating the need for multiple pieces of equipment. Uses include: food processors, beverage distribution, warehouses, manufacturing plants, new construction. For areas with width restrictions see our walk-behind floor scrubbers.